The death clock tells when someone is going to die by dinging and displaying the date on a read-out after the person sticks their finger in a depression on the death clock. 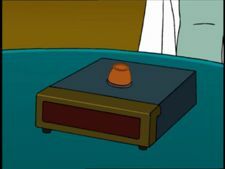 Professor Farnsworth has invented this at least 2 separate times due to his senility. Leela: Does it really work? Prof. Farnsworth: Well, it's occasionally off by a few seconds, what with "free will" and all. Bender: Ooh! Dibs on his CD player!